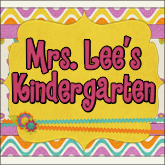 Mrs. Lee's Kindergarten: More Brown Bear Fun and Lots of Pictures! 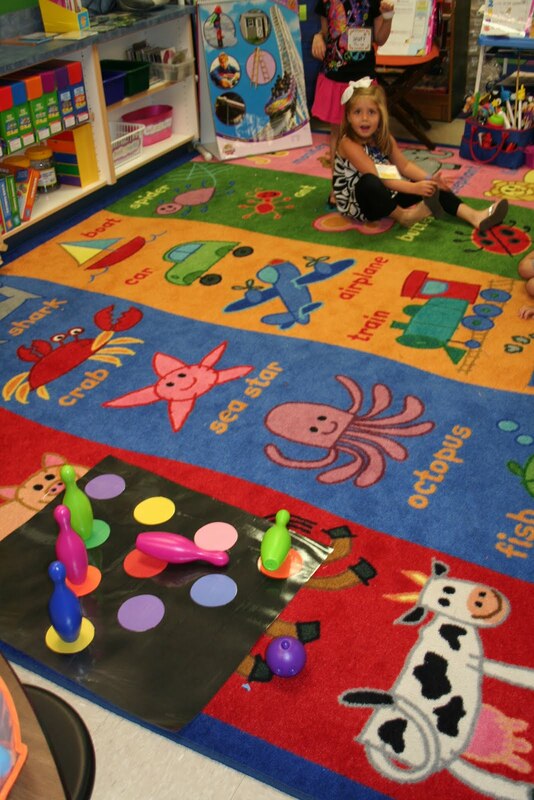 In the midst of continuing rules and procedures, we hit centers hard this week learning how to play our "roll and dot" games, "spinner games", and how to use bingo dotters. 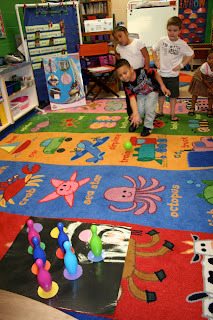 Notice the mat...this made it easy for my kids to set up the pins once they knock them down...Hint...make the circles large enough so that if one pin falls over it won't knock them ALL over or else they will get "6" or "10" every time depending on how many pins you use. 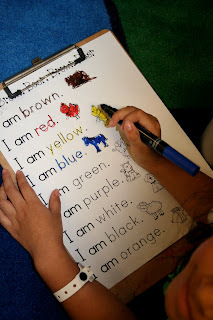 We practiced our sight words using this reader...I used this to teach my students how to use the word wall to find color words....they did so good! Of course, we read it too! My student teacher read Elmer for Rainbow Day today and they made a big patchwork Elmer...we used this activity to name the shape and color. We celebrated Rainbow Day by Reading the poem Rainbow Hair and then we made our own "Rainbow Hair" to wear!! They LOVED it! Torn paper rainbows...this is one of my favorite projects to do at the beginning of each year. These go home in their K portfolios in May! Every year on black day we read Miss Nelson is Missing by James Marshall...if you have never read it...It's a Must! We made a Miss Viola Swamp. But hey, it's a long weekend! You can find many of the Brown Bear Activities shown above at my TpT store...if you want to know specifics...please ask! WOW! You accomplished a lot with your kiddies. I'm seriously impressed. Looks like you had lots of fun and got a lot done. 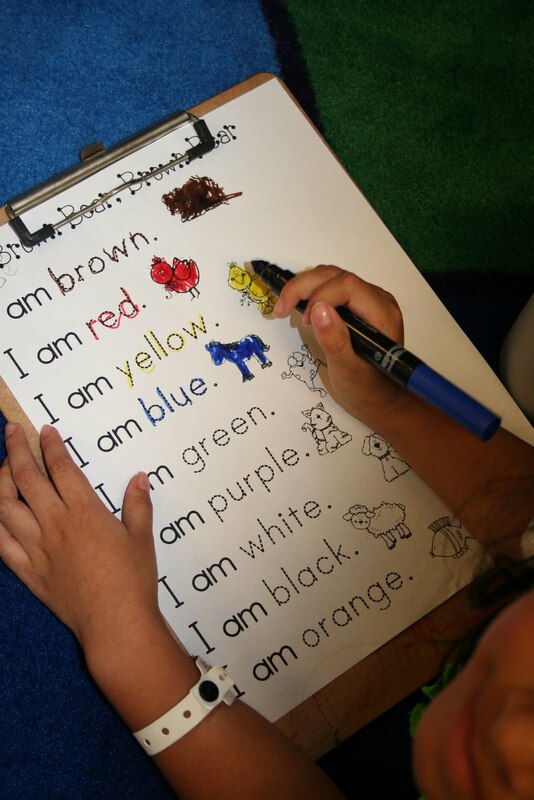 Do you have the rainbow handwriting sheet somewhere? My kids definitely need some work on pre writing. Love all you great ideas. Is the rainbow strokes practice sheet included your Brown Bear packet? If not, would you be willing to share? I use the Rainbow Hair poem, too. Love the idea of wearing rainbow hair! Thanks for sharing! I love your textured Brown Bear book! What types of things did you use to texture the pages? Thanks! LOVE ALL OF IT!!!! Comparing Miss Nelson's class to your class...priceless! 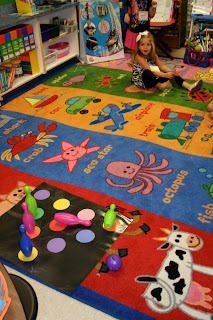 Good idea with the bowling pin mat also!!! I LOVE those little things that seems so simple, but seem so hard for me to think of =) without great teachers like you who share!!! What fun Brown Bear activities. We just read that book last week. Thanks for sharing. Wow! You are incredible... your students are so VERY lucky to have you! absolutely love all your ideas and the brown bear unit! it was well worth the purchase :) any chance you could email me the sequence of your lessons for the unit, like a previous comment requested?! i'm a second year kinder teacher and still learning the ropes! thanks so much in advance... i can't get enough of all your ideas! Can you remind me where to go to get the Brown bear graphics? Do you know the author of the Rainbow Hair book? I was wondering where to find the pages for the texture book? I just downloaded the brown bear color unit on TPT but didn't see them included. Thank you! 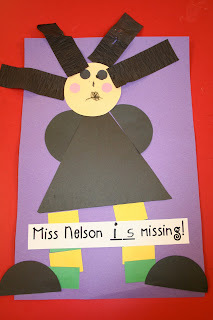 I love love love the Miss Nelson activity! 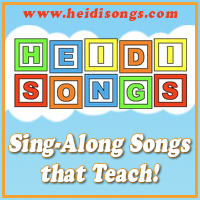 I have been searching for new activities to go with my favorite read alouds...and this is perfect! Just curious....did you do this as a shapes lesson too? was it a TLC type project? It is do adorable!..can't wait to do this with my kinderbears!! I would appreciate any info you would be wiling to provide.